These puppets can be used for the Christmas Tree Puppet Show and the Christmas Program How Lovely Are Your Branches. 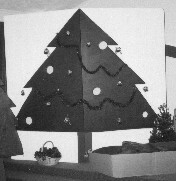 I first used the Christmas ornament puppet show in 2002. I wrote out the script, then figured out how to make the puppets. I used plastic drink bottles for three of them. The light and star were very hard to make. 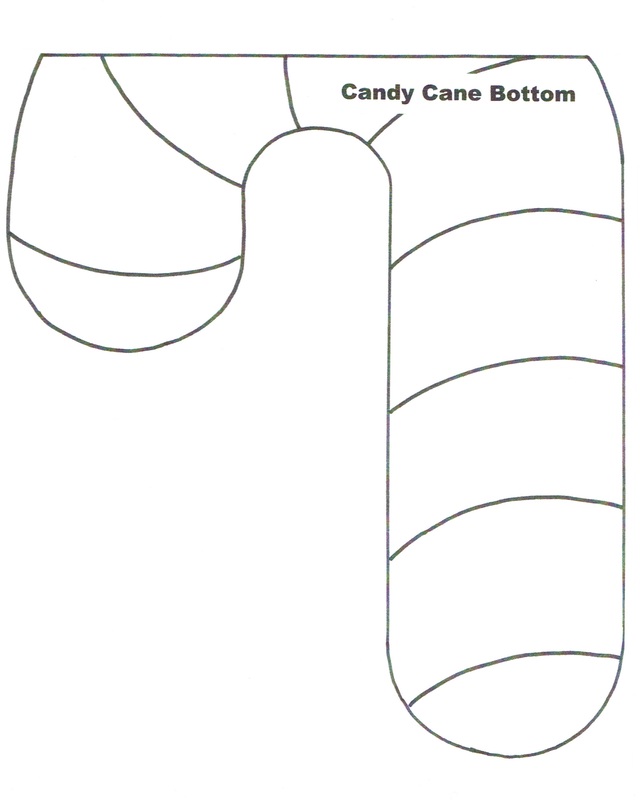 I made the candy cane into a sock puppet and had the puppeteer hold his arm in the shape of a candy cane. I came away disappointed with the candy cane puppet and the bell puppet, but the show went well in spite of that. In fact, that program was a favorite in our church. This year (2012) I want to do the show again, but I wanted to improve some of the puppets. 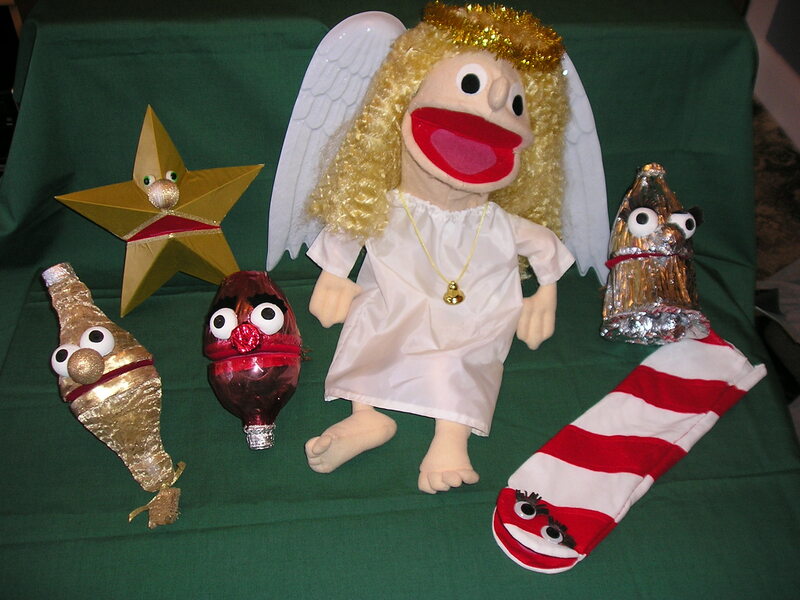 Once I finished the candy cane and bell I knew I could explain how to make all the puppets. 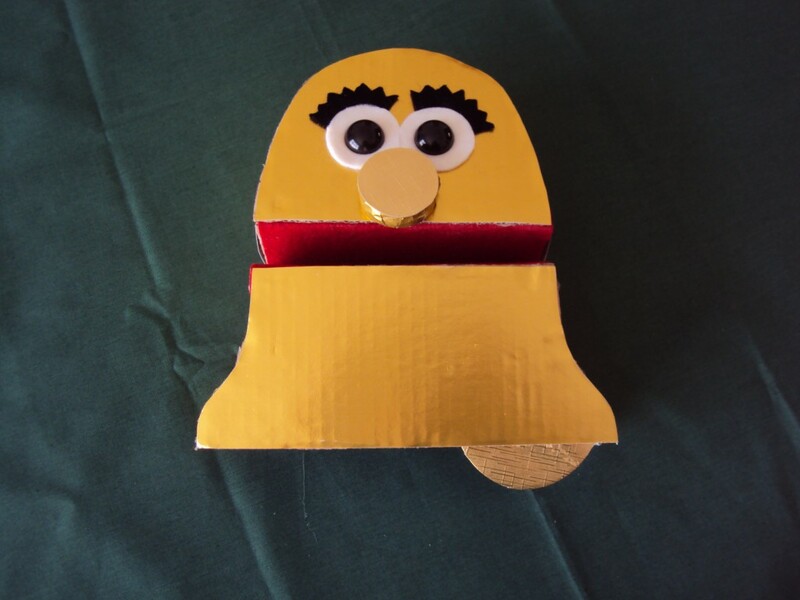 I am including patterns for all of the puppets with instructions for how to make the bell. Once you’ve made the bell, you’ll be able to see how to make the rest. I’ve also added pictures of the bell at various stages of construction to make it easier to follow the directions. One bell top, one bell bottom, a strip for the sides of the bell top, 2 strips for the bell bottom sides. Mark fold lines ½ inch (1 ½ cm) from the edge of each long side of the strips. Cut v-shaped notches along the long side of each strip to accommodate curves. two bell tops and two bell bottoms. Cut along dotted lines in one top and one bottom (for the bell back) to leave a gap for the hand grip. For braces: cut two strips, each 2 x 12 inches (5 x 31 cm). Top brace: 1 inch (2 ½ cm) from the end, then 2 ½ inches (6 ½ cm) farther, then 4 inches (10 cm) farther, then 2 ½ inches (6 ½ cm) farther, then 1 inch (2 ½ cm) farther. Bottom brace: 1 inch (2 ½ cm) from the end, then 2 ½ inches (6 ½ cm) farther, then 4 ½ inches (11 ½ cm) farther, then 2 ½ inches (6 ½ cm) farther, then 1 inch (2 ½ cm) farther. Hinges: two strips, each 4 x 1 inch (10 x 2 ½ cm). 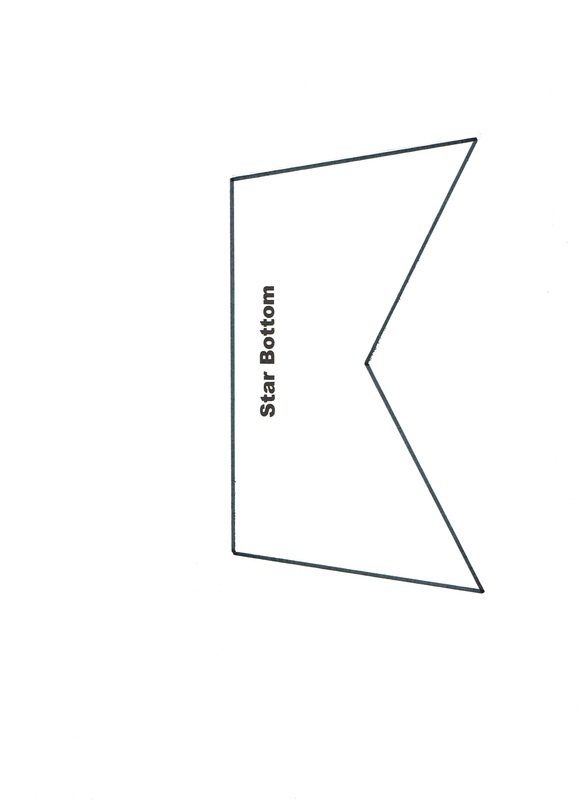 Fold each in half at 2-inch (5 cm) mark. From red felt: 1 mouth, a 6 x 6 inch (15 x 15 cm) rectangle. From white felt: ( if desired) two white circles for eyes. From black felt: ( if desired) one set eyelashes according to the pattern. 1. Using tacky glue, glue gold foil bell top to cardboard bell top front to add strength. Do the same to the bell bottom. 3. 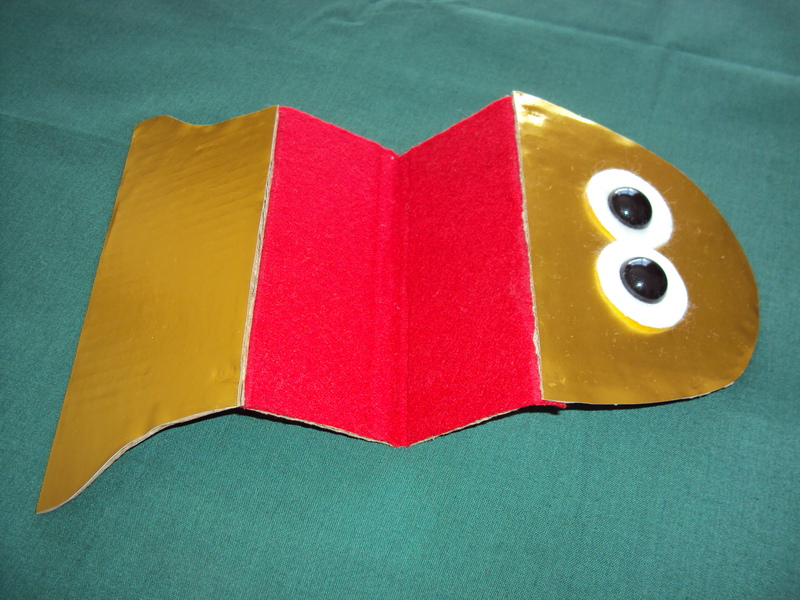 When the glue is dry on above pieces, glue the red felt extension to the back of the gold foil top and bottom so that when it is folded the fold top and bottom meet with the mouth gripped in the hand of the puppeteer. Let dry. 4. If you are using teddy bear eyes which have posts and must puncture the bell face, this is the time to add the eyes. Make a hole for each eye with a large needle, then make hole bigger with an awl or ice pick until the hole is the right size. Insert eyes. If using white felt around the eyes, insert post into the white felt first, then into the face of the bell. 5. Using hot glue, glue braces to the top and bottom of the bell front. Fold brace along fold lines, then hot glue in place. 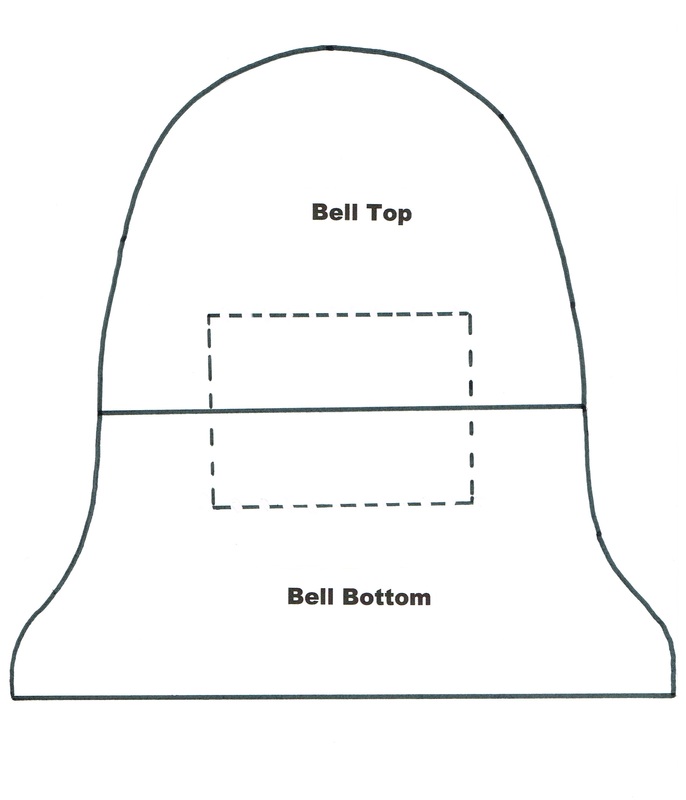 Position the bottom brace against the bottom of the bell. Position the top brace high enough to leave room for the fingers to grip the mouth. 6. 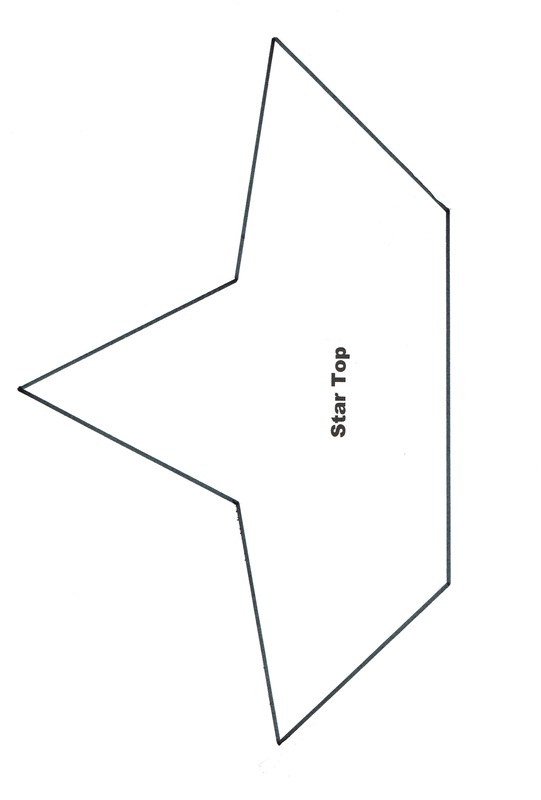 Bell sides: Fold sides along fold line. Using hot glue, glue the sides to the top of the bell front by gluing the tabs which are formed by the notches. Start at one mouth edge and glue a bit at a time, making the side bend to form the top curve of the bell. Trim any excess by the mouth. In the same way, glue the sides to the bottom of the bell. 7. Glue the cardboard back to the top and bottom sides in a similar way. Make sure the handgrip is already cut out of the back (along the dotted lines) before you do this. 8. Glue both hinges to the top of the bell, with the fold line folding where the mouth bends. You’ll need to trim a bit so the hinge doesn’t extend past the side of the bell. 9. Find a nice person to hold the bell together so that the mouth meets perfectly in the front. Glue the bottom of both hinges to the bottom of the bell. 10. Fold about an inch from either side of the finger grip and thumb grip and glue the inch to the inside of the mouth in a position that will be comfortable to hold and operate the puppet. These grips hold the puppet’s mouth closer to the puppeteer’s hand, making movement more comfortable. 11. Add any ornamental or facial features you haven’t added yet. Experiment with the look of the face and add eyes and a nose as desired. In a real bell the clapper would not show, but you can add a half-circle of gold foil if you want to create more of a bell illusion. Possible noses: a Styrofoam ball covered with gold foil (not cardboard backed), a gold plastic ornament. I used a cap from a bottle. Cut a circle of gold foil (not cardboard backed) bigger than the cap. Hot glue the center of the circle to the top of the cap. Cut slits from the edge of the circle to the cap. One by one, fold back foil side pieces and glue to the sides of the cap. Push the ends of the paper to the inside of the cap and glue. Glue a piece of Styrofoam to the inside of the cap, then glue that to the puppet face. 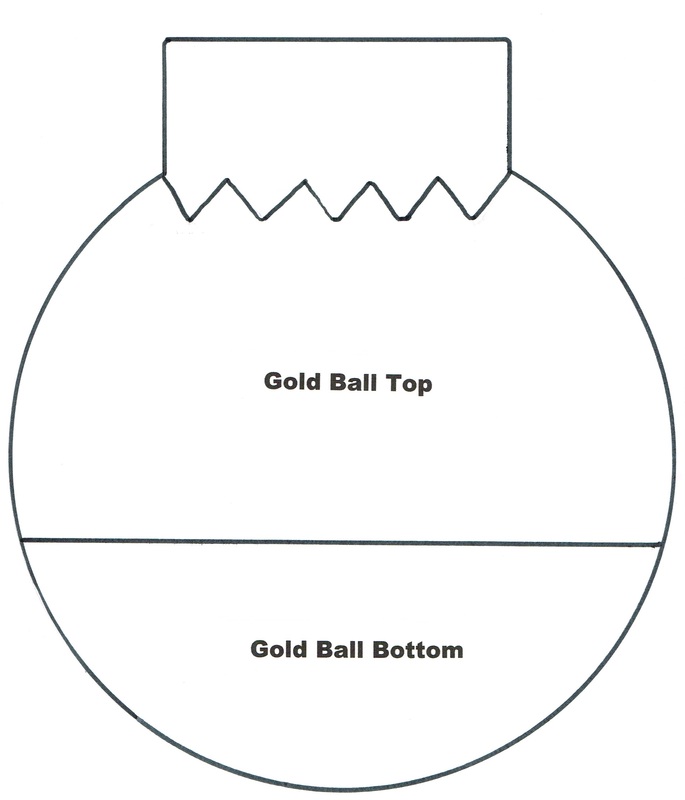 To make the gold ball, light, star, or candy cane proceed in the same way as the bell. Use appropriately colored poster board for front and sides, or assemble and paint. I used red felt for the front and sides of my candy cane. Measure the sides with a cloth measuring tape to determine length for the strips. All side strips should be 3 ½ inches (9 cm) wide, 2 ½ inches (6 ½ cm) for the width + 1 inch (2 ½ cm) for side extensions. 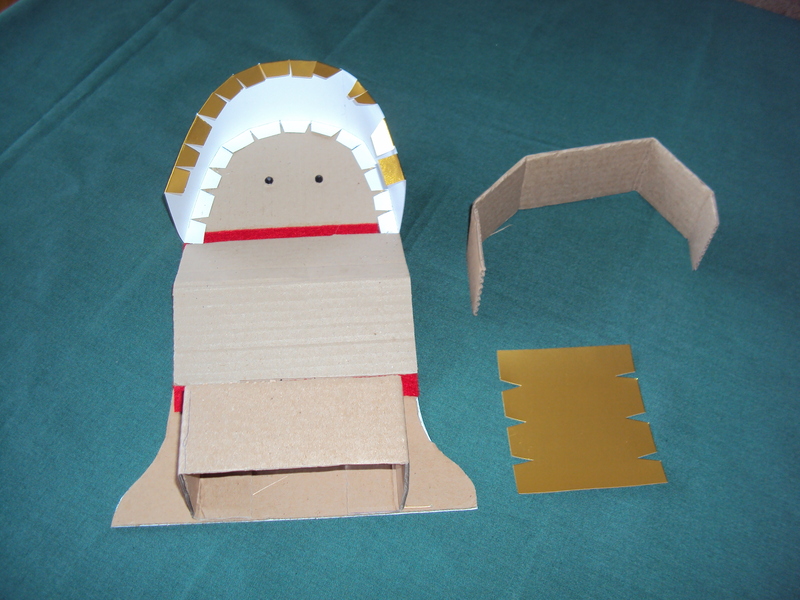 Measure the width of each mouth, then make the cardboard 5 inches (13 cm) on the other side (2 ½ inches (6 ½ cm) folded). Cut the red felt 6 inches (15 cm) on the other side (2 ½ inches (6 ½ cm) folded plus 1 inch (2 ½ cm) for extensions.) You may note that my candy cane is quite large. (see photo). I would make it smaller next time and have given the pattern for the smaller size. Start with a muppet style people puppet. Make wings of gold foiled cardboard or purchase wings. Make a white robe. Add a halo if desired. For a gown I cut a rectangle for the front (12 x 13 inches (31 x 33 cm)), two rectangles for the back (each 6 x 13 inches (15 x 33 cm)), and four rectangles for sleeves (about 3 ½ x 6 inches (9cm x 15 cm)). Sew sleeve fronts to gown front, even with sides and about 2 inches (5 cm) from the top. Sew sleeve backs to gown backs in the same way. Adjust to fit. Sew hem in sleeve. Sew front to backs at side seams. Turn top edge over about 1 inch (2 ½ cm) and sew a pocket for elastic. 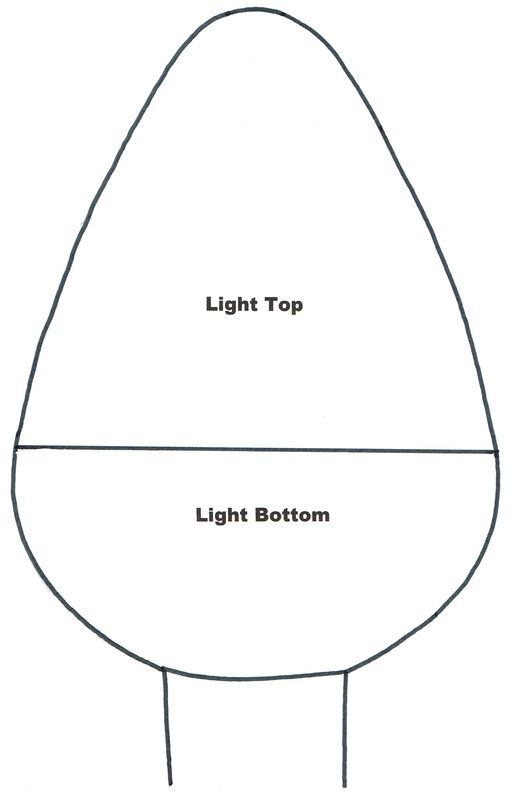 Hem bottom and sides. Insert narrow elastic to fit neck edge. Add snap at neck. Here’s a picture of the angel puppet with my original puppets. Patterns: Sorry, you’ll need to enlarge these so each just barely fits on an 8 1/2 x 11 or A4 page to be the proper size. You will need 2 very large pieces of cardboard (like 2 sides of a refrigerator carton). Hinge them together in the middle with duct tape. 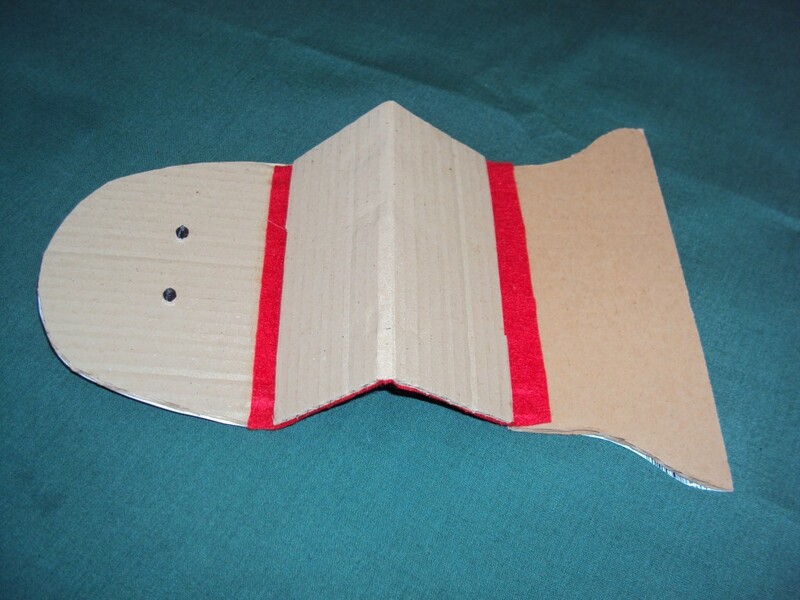 OR cut a cardboard hinge the length of the cardboard and about 5 inches wide. 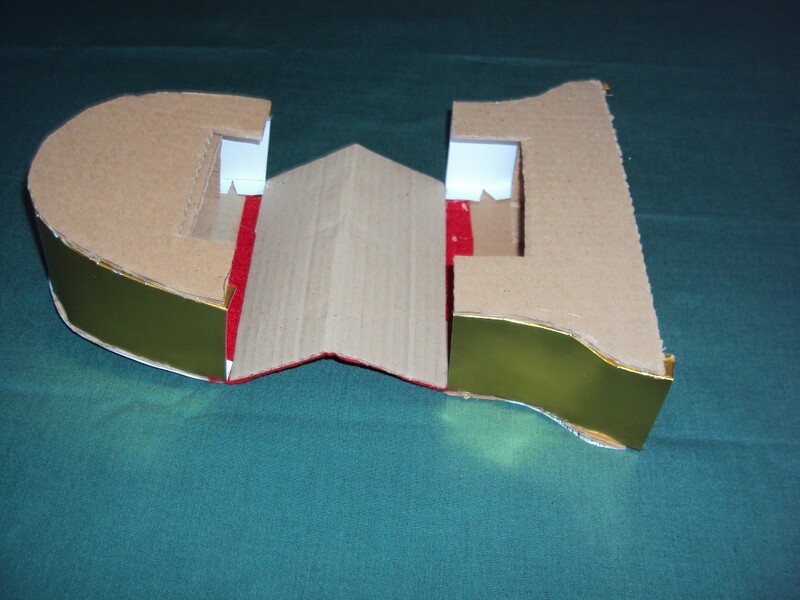 Fold it lengthwise down the middle and hot glue the hinge to the back of the both pieces of cardboard so that you have one large piece that folds in the middle. Draw a Christmas tree as tall as the cardboard and as wide as you can. Then position the puppeteers behind the cardboard. The ones who operate the bottom puppets can kneel. Ones in the middle can stand. Tree Angel at the top will need to stand on a very sturdy stool or ladder. 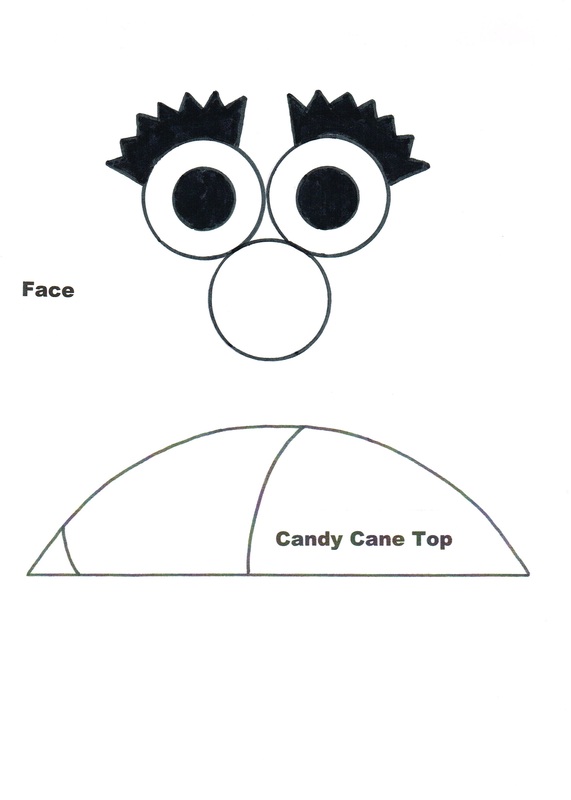 Adjust position of puppeteers until you find positions that make the tree look right and allow the puppeteers to kneel or stand in a comfortable position while holding his puppet through the hole. When you are sure you have this right, cut the holes. Paint the tree green. Paint around the outline of the tree with a background color, preferably the color of your background walls. Paint the trunk brown. All some tinsel garland to the tree and a few simple ornaments. We set the two sides at an angle to each other (about 120 degrees) to hold it up. Having it angled in the middle, rather than flat, helped hide the puppeteers from the audience. To keep it from falling backward, you could also attach an L-shaped brace to each edge of the bottom. You may place the tree in a corner, but leave room for puppeteers to enter and exit. To keep the tree from falling forward, place a couple of very heavy, large wrapped packages in front of the tree. 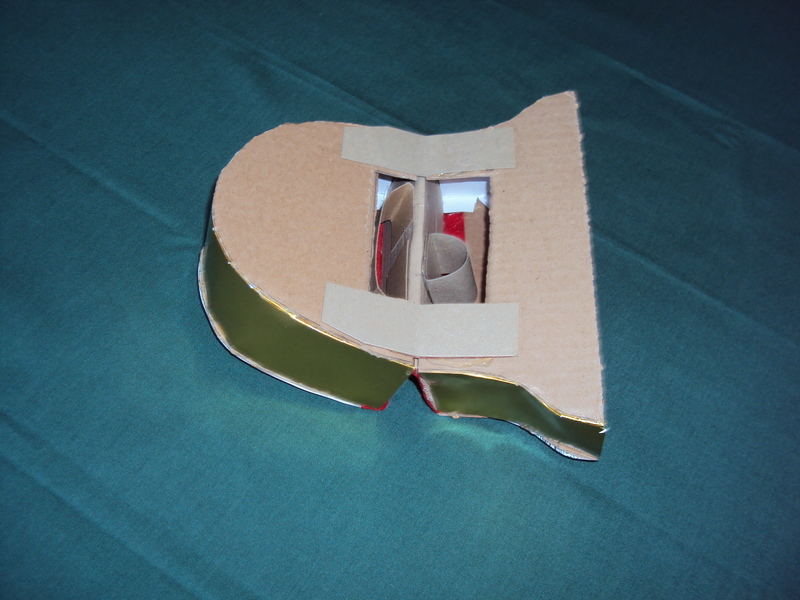 You could also attach a brace to the cardboard and the package.